The Breville 800ESXL is designed for novice and intermediate espresso lovers who aren’t ready to splurge for a $1,000+ machine. It has a compact design with sturdy, stainless steel construction and comes with everything you need to pull a quality shot with a beautiful crema. For those who crave full control and want to shoot for the best shot possible, replacing the pressurized filter baskets with non-pressurized baskets is cheap and will give you cafe-quality espresso for well under a grand. The 15 bar, made-in-Italy pump is durable and gets the job done right. The Thermoblock heating element flash heats water to the proper temperature. The Triple Prime Pump preinfuses your grounds before extraction, allowing them to absorb water and bloom in the filter. This has 4 benefits described in the Standout Features section below. The Auto Purge feature ensures the water is always at the right temperature when switching from steam wand to extraction. The froth enhancer attaches to the end of the wand and makes frothing milk incredibly simple. You can make better foam without the enhancer, but the enhancer allows anyone to make good foam. This model does lack some of the features of the more expensive brands — no Auto-Off, no pressure gauge, can’t steam/extract at the same time — but overall I’m impressed with the Breville 800ESXL’s design and functionality for its price range. Please note the Breville 800ESXL does not come with a built-in grinder. Personally, I like having my grinder separate. 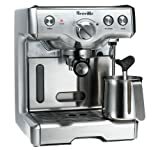 But if you’re looking for an all-in-one espresso machine take a look at the Breville BES870XL Barista Express. Built like a brick, the Breville 800ESXL is a solid piece of slick stainless steel. The buttons on the display panel are big and bold, and I like the water level indicator on the back panel. Design appeal is subjective, but I think this is a good-looking machine. Breville offers a 1 year warranty, but that doesn’t speak to the longevity of this machine. If properly maintained, you’ll have it for years. The stainless steel components hold up extremely well, and the 15 bar pump is made (well) in Italy. The biggest complaint that’s turned up in my supplemental research is occasional clogging of the pressurized portafilter basket. This can be solved by switching to non-pressurized filter baskets, the pros and cons of which are noted in the Potential Shortcomings section below. Espresso is very much the definition of “you get out what you put in.” The Thermoblock heater gets sufficiently hot, and the included pressurized filter basket will produce a consistent shot of very good espresso with a noticeable crema almost every time. Unfortunately your espresso won’t go from “very good” to “great” unless you upgrade from the pressurized filter basket to a non-pressurized filter basket, as discussed in the Potential Shortcomings section below. Cleaning is a breeze. After every shot just remove the portafilter and wipe down the showerhead. The exterior and drip tray can be wiped down as needed. You should descale every 2-3 months with a mixture of 2 parts white vinegar and 1 part water. To clean the frother, unscrew the tip of the frothing wand and let it soak in hot water to break up any solids. Then run the frother without the tip to loosen any debris in the wand. Click. Pause. Click. Pause. Click. That’s the sound of the Breville 800ESXL’s Triple Prime Pump preinfusing (or pre-wetting) your coffee grounds before beginning extraction. Overall this results in stronger, cleaner, more uniform extraction and a better shot of espresso. The Thermoblock system siphons off only the water needed for extraction and steam instead of heating the whole tank. This means quicker heating but has the downside of less precise temperature control. The water reservoir is large, which means you won’t need to refill it as frequently. To slide it in/out you need to remove the drip tray, but this isn’t required for refilling. At the top-back of the machine there’s a panel which folds down where you can pour in water to fill the tank, as shown below. There are two types of filter baskets: pressurized and non-pressurized. The Breville 800ESXL comes with pressurized portafilter baskets, which are great options if you want to take additional complexity out of your espresso. Benefits of Pressurized Filter Baskets: They’re more forgiving and will provide a more consistent shot even if the grind itself lacks consistency. You’ll get a crema every time, but it will result from aeration and not be a true crema. Downsides of Pressurized Filter Baskets: They put a ceiling on how great your espresso can be. Non-pressurized filter baskets aren’t forgiving, which means the range of outcomes is much wider. A poor grind will result in sub-par espresso without a crema, and a great grind will result in something magical. Note: This is only a potential shortcoming if you want complete control over your shot. For these folks, you can swap out the pressurized baskets for non-pressurized baskets. Breville sells a pair of proper sized 50mm non-pressurized filter baskets for around $50. If you want simplicity, the pressurized filters are actually a benefit. Water is controlled by the selector dial, and there is no auto-stop feature. If you don’t move the dial to the off position, the machine will keep extracting your shot. You’ll just have to pay attention and turn it off when you want it to finish. I also wish it had a pressure gauge, but these are more small annoyances than anything else. Compared to other espresso machines, this one is a noticeably noisier.